The thirteenth season of Doctor Who is also arguably its best of all time. Certainly, it’s got a lot going for it. In this season, you get arguably one of the best (and certainly the most iconic) actors to take the role of the Doctor in Tom Baker, and perhaps the best companion with Elisabeth Sladen’s portrayal of Sarah Jane Smith … and it’s in this particular season where the wonderful chemistry between the two really begins to shine. You also have Phillip Hinchcliffe at the helm as producer, finally steering the show away from its action-adventure period with the Third Doctor towards a more horror-inspired era heavily influenced by the Hammer films of the 1950s and 1960s … and the brilliant Robert Holmes as script editor. The show hit a creative peak during this season that’s been largely unmatched, before or since – imagine the possibilities if only this amazing creative team had been given the budgets and the special effects technology of the modern show! Season Thirteen has a number of outstanding episodes – the fantastic “Seeds of Doom”, the delightful Frankenstein-inspired “Brain of Morbius” (a story that Ken and I like so much we named this site after it! ), and the chilling “Pyramids of Mars”, which made our Top 5 Classic Who Episodes list. But pretty much all of the stories in this season are exceptionally good, with the possible exception of “The Android Invasion”, which mostly suffers by unfortunate comparison – put it in virtually any of Tom Baker’s other seasons as the Doctor, and it’d be closer to the top, rather than the bottom. Compare that to almost every other season, even including the modern iteration of the show. There’s almost always at least one clunker in there, if not two or three! So to have a season of solidly “good” stories, with half of them being standouts, if not classics … well, it’s impressive indeed. 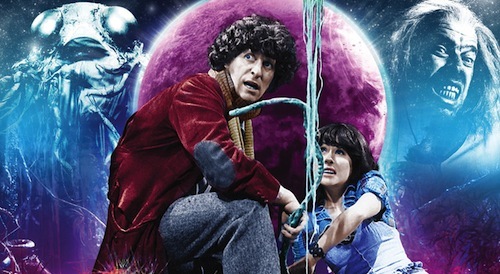 One of my favorite Fourth Doctor stories – and another that I think gets overlooked from Season Thirteen, lost in the shuffle of so many good episodes to watch – is “Planet of Evil”. It’s the first real story where the Fourth Doctor and Sarah Jane Smith step away on their own, away from Harry Sullivan and the last vestiges of UNIT, and forge their way through the universe in a bold new direction. Like many of the Hinchcliffe/Holmes stories of this time, “Planet of Evil” cribs liberally from gothic horror stories – in this case, “The Strange Case of Dr Jekyll and Mr. Hyde”, with a more modern splash of “Forbidden Planet” thrown in for good measure – and puts its own Who-laden spin on the tale. “Planet of Evil” opens up in the year 37,166, at the edge of the known universe, where a scientific team is studying anti-matter on the lonely planet of Zeta Minor. Professor Sorenson – the leader of the scientific team – is slowly going crazy, and while the rest of his crew is still sane (good!) they’re also being murdered by sinister invisible monsters (bad!). One of the last members of this crew manages to activate a distress call before shuffling off this mortal coil, though, so the signal is picked up by both the Doctor and Sarah Jane in the TARDIS, and by a military exploration ship. The Doctor and Sarah Jane arrive first, and are immediately blamed for all the deaths by the crew of the exploration ship that arrives later. Wacky hijinks ensue as the Doctor tries to convince everyone that what’s really killing everyone is an anti-matter creature, except no one’s listening except Sarah Jane (as usual) – and the anti-matter creature’s taking physical form through Sorenson, who’s apparently been busy drinking enough anti-matter soy espresso venti lattes to become an anti-matter monster himself! Though “Planet of Evil” is a fairly straightforward story, it’s a good one … and it’s dark. The story really doesn’t pull any punches. The desiccated corpses of the science crew visible early on in the first episode make it clear that this is going to be a bleak, somber story. (You can see how those who still viewed Doctor Who as solely a children’s program, like Mary Whitehouse, would clearly be dismayed by Philip Hitchcliffe’s reign as producer!) The character’s lives are in constant danger, whether from each other, or from the anti-matter creatures lurking on Zeta Minor … or from the horrors exotic alien jungle, which is worth its own special mention. Designer Roger Murray-Leach created a beautiful set for the jungle scenes that still looks terrific even when watching the story today – it’s a far cry from the typical “spray-painted styrofoam and tinfoil tied together with a bit of twine” cheap sets that unfortunately were all too common in the stories from this time. Done properly, with proper dim lighting to set the mood, rather than the constant over-bright lighting common to everything recorded in the BBC’s Television Centre … anything featuring the jungle sets is a treasure to watch. It makes you wonder what might’ve been possible production-wise in the stories of this time if only the BBC had been a bit more flexible! Another of the main reasons that the story works so well is because of the Doctor and Sarah Jane. 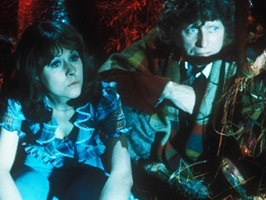 Tom Baker, in his second season in the role of the Doctor, is starting taking the opportunity to truly make the role his own … and he’s paired with Elisabeth Sladen, starting her third year as Sarah Jane. Top this amount of time they’ve spent in their respective roles with the clear chemistry between the two actors – it’s quite evident that Tom and Lis have a great deal of affection for each other – and you’re seeing a Doctor/companion pairing that isn’t trying to figure out exactly what that relationship really is, as it does in so many other seasons. They’re best friends, and they trust each other implicitly. And this trust comes across not just in the acting, but in the writing as well – when Sarah Jane heads back alone to the TARDIS through the jungles of Zeta Minor, there’s a moment where it’s clear the Doctor doesn’t want her to go … but he also knows she’s resourceful, and she’ll do the right thing, so he doesn’t try to stop her. There’s several scenes where Sarah Jane gets to do far, far more than just ask “What is it, Doctor?” in “Planet of Evil”, and it’s lovely to see the many nuances Elisabeth Sladen gives to the character. The other characters (with one major exception, noted below) bring a lot to “Planet of Evil” as well. Frederick Jaegar’s unhinged Professor Sorenson can get a little over the top at times, but he plays the part of obsessed scientist very well, and as he starts transforming into the “Anti-Man” – the Hyde-like villain of the story – you can’t help but feel a little sorry for the deluded fool. 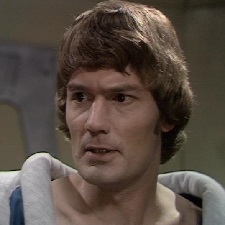 Also worth mentioning is Ewen Solon, who plays Vishinsky, the second-in-command of the military ship. Vishinsky’s an interesting character in that he realizes fairly early on that what the Doctor is saying about the dangers on Zeta Minor is correct … but he’s not always in a position to do anything about it. There’s a nice balance between military duty and pragmatic realism with the character, and the conflict he finds in reconciling the two, and he’s both fun and believable to watch. Not that everything about “Planet of Evil” is always brilliant, of course. For as wonderful as the filmed studio jungle sets are for the story, things get decidedly less impressive when the story returns to the video cameras and sets of BBC Television Centre Studio 6. Apparently military spacecraft in the year 37,166 are quite minimalist, utilizing cheap glass-and-chrome furnishings from some IKEA knockoff store to represent a supposedly high-tech control room. (Sharp-eyed viewers will notice that this set gets a terrific makeover the next season, though, when it’s transformed into the control room of the Sandminer in “The Robots of Death”.) Also, the electronic effects for the anti-matter monster – the in-theory scary “Big Bad” of the story – while reasonably good for the time back when “Planet of Evil” originally aired in 1975, don’t hold up well at all some forty years after the show originally aired. And then there’s Salamar, the commander of the military ship. Bless Prentis Hancock, who played the character, but he’s straight out of the William Shatner/David Caruso School of Overacting. (When he arrives at Zeta Minor to survey Professor Sorenson’s abandoned outpost, I kept waiting for him to put on a pair of sunglasses while The Who’s ‘Won’t Get Fooled Again’ started blaring in the background.) He’s just ridiculous in the part, and it doesn’t help that he’s been handed a ridiculously-written part in the first place – he’s all blustery pompousness, doing virtually nothing that’s helpful to find out what’s actually happening on the planet, and often doing incredibly stupid things simply because it’s the opposite of whatever Sarah Jane or the Doctor has just helpfully suggested. Salamar’s just a bad fit all around for an otherwise exceptionally good story, which is a shame (although he does add a certain amount of unintentional comedy to his scenes that’s worth something, I guess). If you can find “Planet of Evil” on DVD, it’s definitely worth picking up – apart from getting to watch a terrific story, the extras on the DVD are certainly worth a view as well. The “making-of” feature called “A Darker Side” covers the production aspects of the story, such as the making of the aforementioned brilliant jungle set at Ealing Studios, as well as the evolution of the script from its initial concept to its final draft. Meanwhile, the feature called “Planetary Performance” focuses on the acting side of the story, including a lot of interesting insights from both Tom Baker and Elisabeth Sladen about their acting relationship, and what their respective takes on their roles where during this time period. If – like me – you’re an absolute junkie for exactly how the show was made during these times, these features are must-watches for you. Is “Planet of Evil” the best story of Season 13? No. But it’s damn fun, and it’s damn good … and if it can be said that there’s a hidden gem in this outstanding season of “Doctor Who”, this would be it. “Planet of Evil” is definitely worth watching. Agree? Disagree? Think that Salamar has been viciously slighted in this review? Post your comments below!